Hoarders is a television show in the Documentary genre starring Matt Paxton, Cory Chalmers, and Robin Zasio. The tv show first appeared on air on 2009-08-17. Our users found the overall impression of this television show to be Educational. The tv show's official site can be found at www.aetv.com/hoarders. An interesting look into the lives of Hoarders. 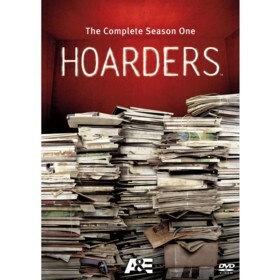 Hoarders examines people that suffer from compulsive hoarding. The show itself airs weekly on A & E and lasts one hour. Each episode of the show looks at between one to two people with the condition. A psychiatrist and "professional organizer" are called in to help the hoarder - to discover the root cause of the hoarding and to help them cure it or control it. The best thing about each episode is how at the end of the show they let you know how the person is currently doing several months later - whether they were able to successfully stop hoarding or if they have slipped back into their old habits. I also like how the show provides each hoarder with six months worth of aftercare funding instead of just abandoning them when the show wraps up filming. They can use this funding to further help clean up their hoard or they can use it on future psychiatrist sessions. I also enjoy the occasional episodes where they pay past hoarders a surprise visit (sometimes over a year later) to see how they are doing. Overall, this is one of my favorite shows on TV - I haven't missed an episode yet :).